Bitwise Magazine: iPad – What, no File Manager ? iPad – What, no File Manager ? Having dashed off a few masterworks of modern literature on my new iPad Air, I naturally wanted to save copies of those documents on my PC. I looked for the iPad File Manager. And I looked again. But I could not find it. Which should not really be all that surprising as there isn’t one. To my bafflement, iOS doesn’t provide any way of browsing around its folders and files. So how, then, was I to get the documents from the iPad onto my desktop computer? I turned to the iPad User Guide. This told me there were two ways to transfer files: either I could upload them to iCloud and then download them, again onto my PC; or I could use Apple’s iTunes software to receive documents one at a time after explicitly ‘sending’ from the iPad. To be honest, neither of these alternatives appealed much. I don’t like the iTunes option because sending documents one at a time rather than copying a whole directory of files is pretty slow and, what’s worse, I frankly hate the iTunes user interface. Uploading them to iCloud is even less appealing. Why on earth should I send my private documents to some unknown location quite possibly halfway across the globe just to transfer them to a computer sitting here on my desk? 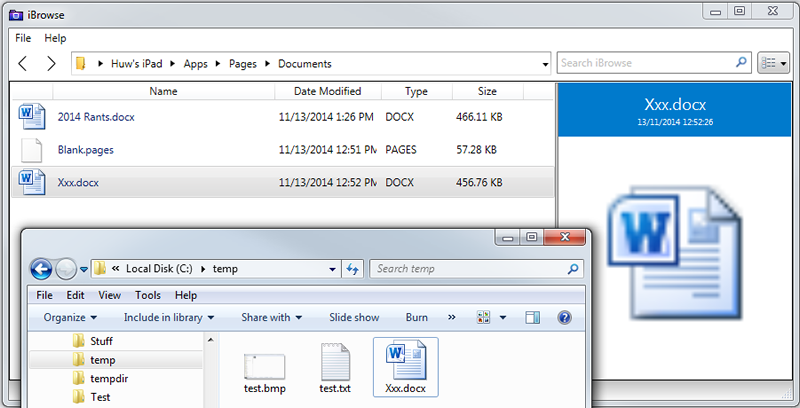 Here, I have dragged files from my iPad using iBrowse (top) right into the Windows Explorer on my PC. There is also a free version of iBrowse for the Mac - that version has a somewhat different user interface but similar functionality. I soon discovered that other alternatives exist. Indeed, there is a small industry devoted to letting people get at their iPad documents more easily and transfer them to and from other computers. I won’t list all the products available – just Google for “iPad file transfer” and you’ll find them. The one I eventually opted for was a free program called iBrowse (made by Macroplant, a company that also sells a more complete file browsing product called iExplorer). iBrowse is available for both Windows and OS X. Once installed onto your desktop computer it lets you browse the folders and files of an iPad or iPhone that is connected via its USB Lightning cable. The only real limitation is that it can’t browse the root directory of your iOS device unless that device has been ‘jailbroken’. I don’t need root access so that has not been a problem for me. I do need a way to copy files around easily, however, and iBrowse does that very well. One thing iBrowse doesn’t do is allow me to access my iPad wirelessly (with WiFi). There is another free product, RemotePC (including the free ‘Lite’ version), that can do that. I haven’t tried this out yet as iBrowse works fine for my current requirements and, what’s more, unlike Remote PC it doesn’t require that I install any additional software on my iPad. However, if I decide that I can’t live without WiFi file transfer, maybe I’ll try out RemotePC at some future date? iPad Air – the best laptop I’ve ever had!